One technique that a number of improvisers have used on this type of tune is to quote 4-bar melodic phrases from pop songs, folk songs, other solos, etc. as a way of building their solo. This kind of quoting can be heard in Cannonball Adderley’s solo on the Miles Davis tune ‘Miles’ (often mislabeled ‘Milestones’ and confused with the John Lewis tune of that name recorded by Miles and Charlie Parker), Clark Terry’s solo on Bob Brookmeyer’s ‘Hum’, and more recently, a solo by pianist Tadataka Unno on vocalist Gabrielle Stravelli’s ‘So What Boy,’ (from her album ‘Waiting In Vain’, available on iTunes), a truly swingin’ vocal tune based on an altered version of the ‘So What’ progression. In a number of these solos, the soloists quote tunes that originally appeared in different harmonic contexts. Adderley quotes ‘I Can’t Get Started‘, a major-key tune, as well as a phrase from Stravinsky’s ‘The Rite of Spring’ over the A minor 7th chord in ‘Milestones’. Unno quotes ‘Rain Check’ and ‘I Found A New Baby’ over the D minor 7th chord in ‘So What Boy‘. (This reminds me of something that one of my jazz education mentors, Alex Stewart, mentioned to me: that he likes to play the dorian mode off the 5th of dominant 7th chords and the seventh scale (i.e. the mixolydian) off the 11th of minor 7th chords.) Gershwin’s ‘Fascinating Rhythm‘ is also quoted in (I believe) all three solos; the tune’s first four measures are used prominently by Adderley and Terry while Unno, by contrast, only hints at the second measure. Finally, to my ear Terry and Unno both quote Miles Davis’ ‘So What’ solo. While I wouldn’t advise a developing improviser to consciously plan to quote tunes in a solo, I think that composing solos that make deliberate use of borrowed melodic material can be a useful exercise for modeling the process of altering and fusing short patterns that occurs at a subconscious level in ‘real-time’ improvising. The title of my tune ‘Now What?’ is a condensation of a question students might well ask when ‘So What’ is introduced in my class: ‘so far we’ve learned a bunch of tunes and melodic ideas based on major and dominant 7th chords, and suddenly we’re supposed to improvise on a couple of long minor 7th chords – now what do we play on that? ?‘ I composed the tune to demonstrate to my class how, in addition to using the dorian scale to improvise on the ‘So What’ progression, one can also use melodic ideas originally based in other modes and harmonic contexts. Using other scales that use the same group of notes as the dorian scale can be an effective strategy, as it was in the Adderley, Terry and Unno solos. When improvising over a minor seventh chord in the context of the dorian mode, one can use ideas based in the major scale starting on seventh of the chord (the tune starts with quotes from Louis Armstrong’s solo on ‘Hotter Than That’ and Ella Fitzgerald’s solo on ‘Cottontail’.) One can also, to use Alex Stewart’s concept, use ideas based in the seventh scale starting on the 11th of the chord (as in the quote from John Coltrane’s solo on ‘So What’). The tune continues with another Ella quote from the same ‘Cottontail’ solo and some patterns based on the one-bar ii-V progressions (these can be found in the ‘Midnight Donna and Reets in Paris’ post) which outline various inversions of the minor 7th chord. The tune goes on to use the 5-4-3-2 licks that we study in my class (these are explained in my post on Anthropology), which can be thought of as based on the major scale but can be applied in a wide variety of contexts, and ends up with some four-bar ii-V-I patterns from Clifford Brown and Charlie Parker which also work over the extended minor seventh harmony of the ‘So What’ progression. I hope you enjoy working on this tune; my solo piano recording of it can be heard by clicking here. 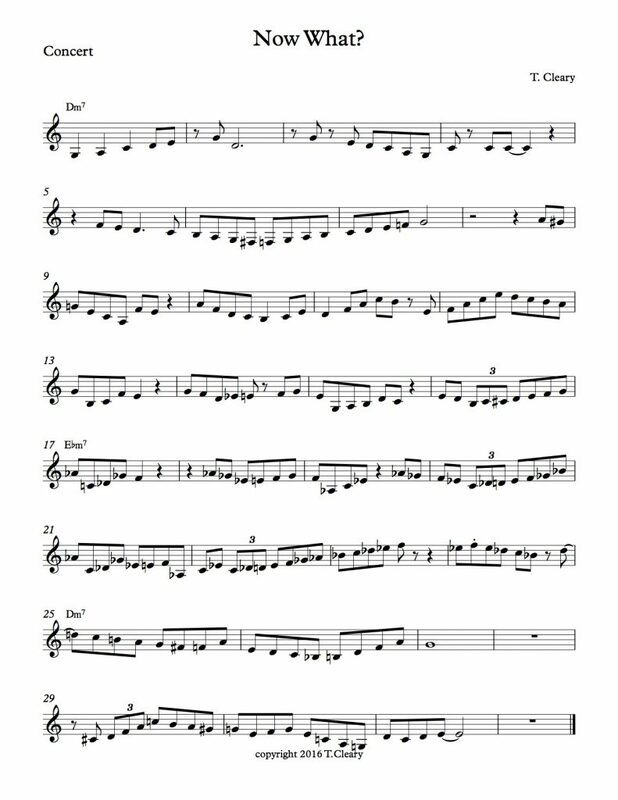 (Although in this solo piano version I do it as a fast samba, keep in mind the tune can also be played or sung slower and with swing eighth notes.) I encourage you to learn the scale/arpeggio outline first, as it shows the context on which ‘Now What’ builds. I hope that by either listening to or working on the tune, you might also get interested in further investigating the solos that ‘Now What’ borrows from, composing your own line on the ‘So What’ progression, or most important of all, doing your own improvising on this progression.